IMAGINE lounging by your very own pool basking in the ocean breezes as you enjoy breathtaking ocean views from this beautiful home.This home is designed to take every advantage of pool and ocean views starting with the large living room furnished with lots of wrap around comfortable seating, a beautiful stone fireplace, easy access to the pool and courtyard.This spacious, one level, beautifully presented 4,000 square foot home with 5 bedrooms and 3.5 baths near one of the best beaches in San Diego. 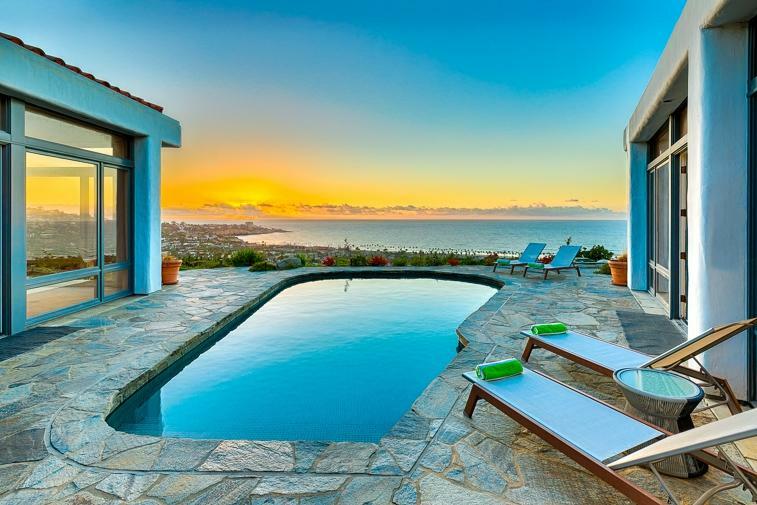 Imagine lounging by your very own pool basking in the ocean breezes as you enjoy breathtaking ocean views from this beautiful home. La Jolla Shores beach is only a mile away and about a 10 minute walk. 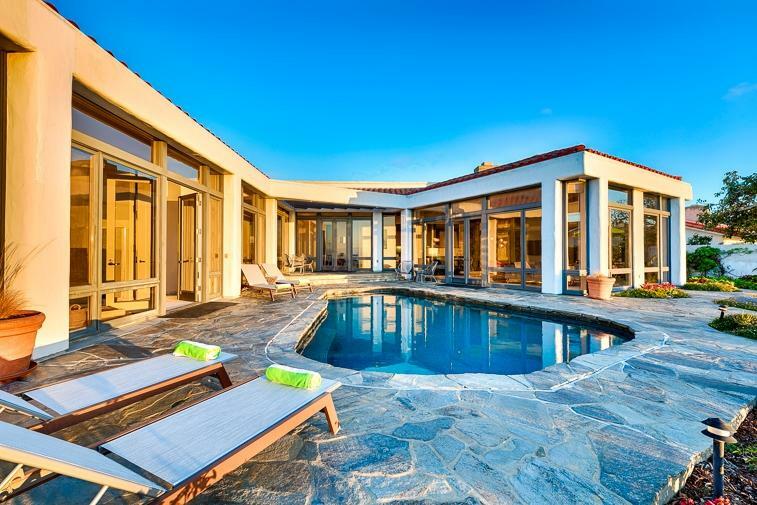 The pool is ideally positioned in a stunning courtyard between 2 wings of this home, so it all can be enjoyed as part of the vista from both in and outside. A table for al fresco dining and a barbecue make this the perfect place for morning coffee, an interlude lunch, or a beautiful dinner by the sea. This spacious, one level, beautifully presented 4,000 square foot home with 5 bedrooms and 3.5 baths near one of the most beautiful beaches is the world is the perfect place for your reenergizing seaside retreat with family and/or friends. Enter and find yourself in a large entryway with a skylight. This area sets the tone for the rest of the home Ã¢â‚¬â€œ spacious, inviting and tranquil. High ceilings throughout the home keep it light and bright while giving it an ambiance of relaxing luxury. 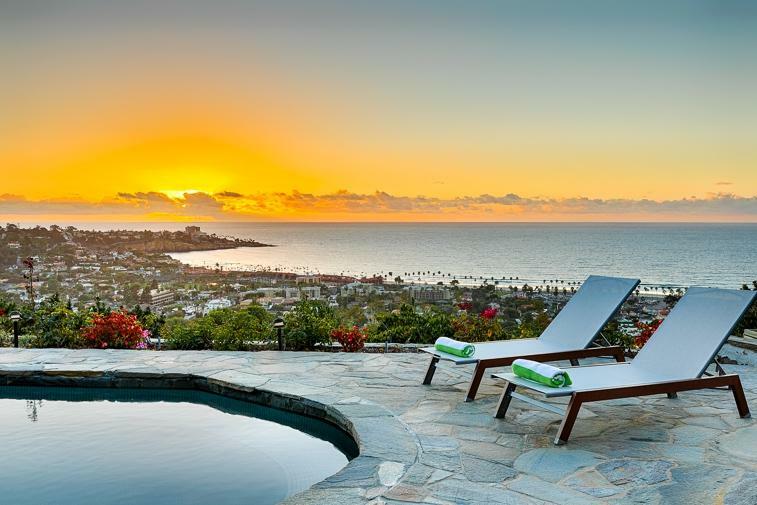 This home is designed to take every advantage of pool and ocean views starting with the large living room furnished with lots of wrap around comfortable seating, a beautiful stone fireplace, a large flat screen TV, and easy access to the pool and courtyard. A beautifully designed gourmet kitchen is the perfect place to satisfy your culinary needs. Especially when you add the food and the fun - as it large enough for several to be cooking and creating at the same time. 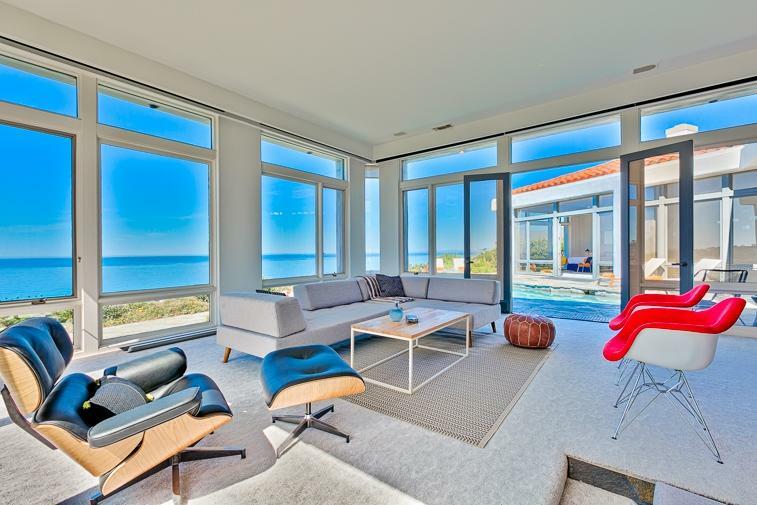 The great roomÃ¢â‚¬â„¢s living area is completed with an ocean view dining area for 6-8. An extraordinary ocean view master suite delights with a king bed, ceiling fan, large flat screen TV, and direct access to the pool and courtyard. It features a full ensuite bath with a beautiful glass tiled shower and a large soaking tub. A large walk-in closet and lots of storage round out this suiteÃ¢â‚¬â„¢s many desirable features. There are two additional bedrooms with en suite baths and 2 others (one with a pool table and bar with an ocean view) so this home comfortably sleeps 10. There are various large screen TVs in the bedrooms, some bedrooms have patio access, and all bed and bathrooms are furnished with luxurious linens for your ultimate comfort. There is also a half bath near the homeÃ¢â‚¬â„¢s entry and a laundry room is available for your use as well. Off street parking is also available for your convenience. There is a three car garage as well as room for 2 cars in the driveway.